Why not treat your garden to a makeover, encouraged by the superb gardens at the Chelsea Flower Show? For an immediate landscaped look with minimal effort, topiaried hedges are a quick way to significantly change your garden. Pyramid pruning gives texture to borders, as seen in Diarmuid Gavin’s Irish Sky garden; the sharp structured hedges contrast with the soft edges of meadow-planted shrubs. “Begin trimming your hedge, starting at the base and working upwards, angling the trimmer to the desired gradient for your pyramid. You can either cut by eye or use a topiary wire mesh to guide you, taking a few steps back from time-to-time to ensure an even cut. 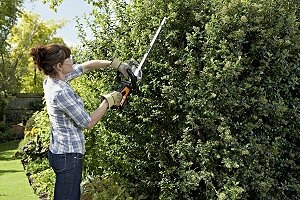 Once you’ve achieved a triangular outline you are happy with, use a pair of hand shears, such as the Worx Shrub/Shear (RRP £49.98, diy.com), to go over the hedge to define the shape. Look out for compact models with lithium-ion technology – this makes the tools super-lightweight so your arms won’t tire. For a formal effect, try box-shearing small leafy trees to create a neat and structured look, as seen in The B&Q Vertical Garden. For further information about the Worx ranges of power tools, please visit the website.